It is that time of year when those of us who are growing courgettes (zucchini) are struggling to keep up with the supply, not that you will hear me complaining. 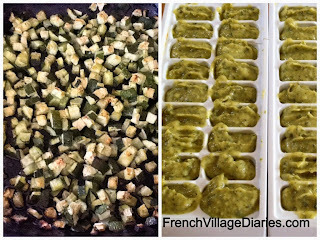 I have spent many happy hours in the kitchen (hence the lack of blog posts) slicing, dicing and grating courgettes into quiches and soups for lunches, caviar for aperos, risotto and curries for dinners, cakes for desserts and chutneys and relish to store. This week, however, I have found the most simple and tasty way to cook them ever. I give you courgette cream. Wash and dice your courgettes. Add to a roasting tin, season with salt and pepper, drizzle with olive oil. Roast until soft, but don’t over do it. I find about thirty minutes in a moderate oven is perfect. Your courgette cream is now ready to use or to freeze for winter use. I freeze in ice cube trays and then bag up the cubes. Until you try it you will not believe how creamy it is, honestly. This recipe works just as well with green or yellow courgettes and any type of squash. For a spicy alternative, add ground curry spices or chilli powder to the oiled courgettes before roasting. For a delicious dip I mixed a couple of teaspoons of pesto with a couple of tablespoons of courgette cream and natural yoghurt. 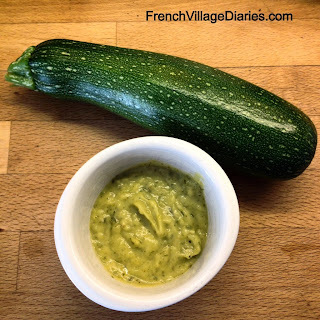 A perfect dip to enhance our current glut of cucumbers from the garden. I am also just a little bit too excited at the thought of adding a handful of cubes to my pasta sauces, casseroles and stews this winter. 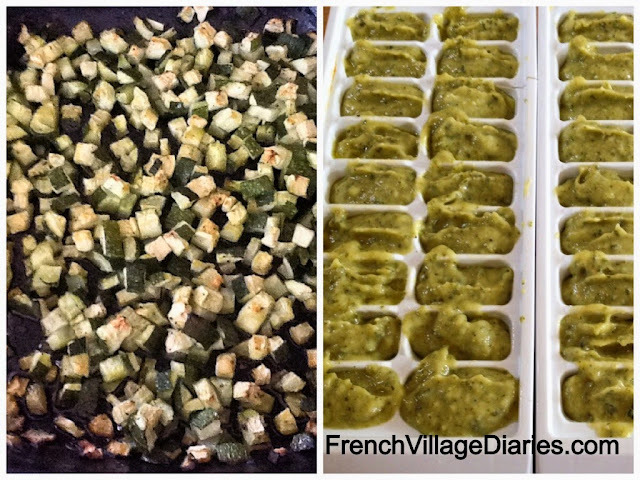 Vivre le courgette!